Kelva Glass-Cleaner is developed for wide glass webs and sheets. 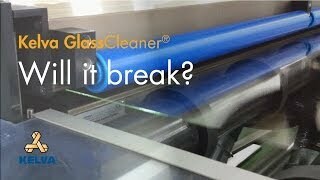 Glass applications, specifically for LCD screen production, demand special designed cleaning solutions. Dust attraction is a characteristic of glass, and a moving web only worses the situation. But to meet quality demands, dust has to be eliminated near perfection. Due to the fragile quality of glass webs, a standard web cleaning system is not an option. Kelva developed a special web cleaning system for the production of glass webs that eliminates dust, at the same time preventing scratching the glass-surface and guaranteeing web and ensuring a quick web threading. Prove that even the most fragile materials can be effectively cleaned. In this case glass, used for touchscreens, is cleaned without leaving a single scratch!